Created over 25 years ago, today, PRESTIGE is an international brand that is represented on four continents by a highly specialised dealer network, trained by the JEANNEAU shipyard. 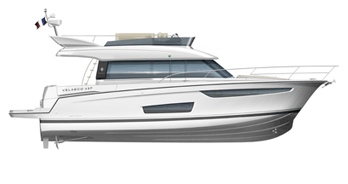 Since 1995, the Jeanneau shipyard has belonged to the Bénéteau Group, specialised in the construction of powerboats and sailboats, as well as prefabricated homes. The Group owns several brands: Bénéteau, Jeanneau, CNB, Prestige Yachts and Monte Carlo Yachts. Visit our website for the latest news and information from the Bénéteau Group.